1.1 The purpose of this report is for the Halswell-Hornby-Riccarton Community Board to consider and recommend to the Council, the dedication of the collector road Sir John McKenzie Drive and other side roads in the Yaldhurst Village subdivision, shown as Lot 601 (serving the residential area) and Lot 613 ( servicing the commercial area) on LT 448725 (lots 601 and 613) under Section 349 of the Local Government Act 1974, rather than the normal vesting following acceptance of the infrastructure, and the issue of a Section 224 Certificate under the Resource Management Act 1991 (“RMA”). 1.2 Lots 601 and 613 cannot vest as a road due to a covenant registered on the land. This is stopping the subdivision from proceeding. Dedication of Lots 601(residential) and 613 (commercial) as road can occur with the covenant in place and will allow the plan to deposit. Although Lots 601 and 613 will remain subject to the covenant after dedication, the covenant themselves will be of no effect as the covenant provisions provide that the covenant lapse on subdivision. Dedication will allow the subdivision to proceed subject to the safety measures being built and approved before a Section 224(c) approval is issued. 1.3 At the Council Meeting of 10 April 2014, the Council resolved that all safety issues will need to be addressed through Variations to the existing RMA consent and all plans altered and approved. No acceptance of the Lots 601 and 613 can occur until the physical safety works on Lots 601 and 613 have been built and comply with all the safety audit requirements. 1.4 This report is being provided following a request from the new developer of Yaldhurst Village, Infinity Yaldhurst Limited, (the “Developer”) for the Council to dedicate Lots 601 and 613 as road so that the subdivision can proceed. The covenant does not restrict the use of Lots 601 and 613 as road, and is a normal standard covenant relating to controls on vertical building standards quality, maintaining trees and hedges, and not running certain farming activities. However, a road cannot vest under the RMA if there are registered interests such as the covenant on the title even where, as here, those covenant do not restrict the use of the land as road. The developer has not been able to obtain the co-operation of some of the landowners required to surrender the covenant. As a consequence, the developer has made the dedication request. 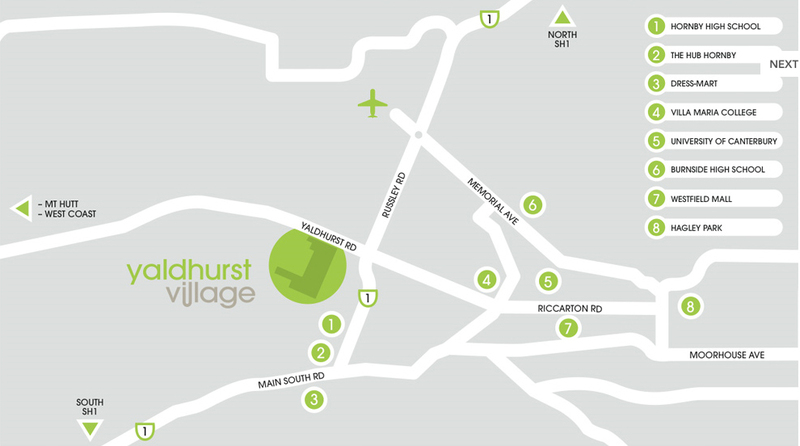 1.5 The dedication of Lots 601 and 613 will allow Stage 1 (residential) of the Yaldhurst Village development to proceed. The dedication of Lots 601 and 613 as road, does not remove the covenant in itself but the covenant will become redundant on the subdivision plan depositing as the covenant provides that it lapses and is of no further effect on the subdivision of the land. 2.1 The decisions in this report are of a low significance in relation to the Christchurch City Council’s Significance and Engagement Policy. 2.1.1 The level of significance was determined by considering that the subdivision and safety requirements and the standards which still apply. 2.1.2 This is about process to allow the vesting of the subdivision and affected land owners adjoined to the subdivision are few. 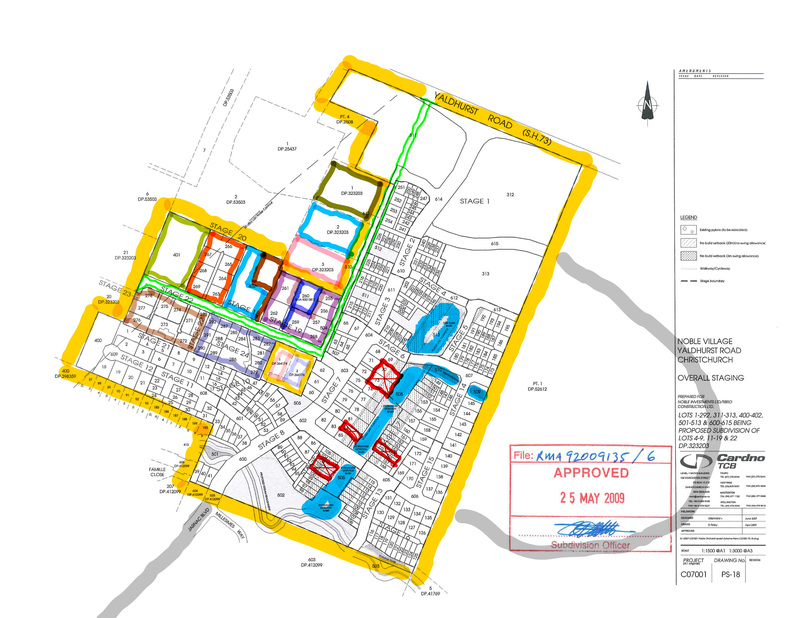 ● Option 1 – For the Council to approve the dedication of the road in conjunction with the Developer continuing the process to remove the covenant from the Developer’s land, (including Lots 601 and 613) pursuant to an application to the Court under the Property Law Act. ● Option 2 – For the Council to take no action and allow the Developer to continue with its application to the Court pursuant to the Property Law Act for the removal of the covenant instrument from Lots 601 and 613 through the Court. ● A faster process than through the Court. ● As part of the Variations, the Developer would agree to the commercial and residential safety audit works being designed and approved. ● The Council would not dedicate the road until all the safety works are carried out to comply fully prior to a Section 224 (c) Certificate being issued for that stage of the subdivision. ● A Deed of Indemnity will protect the Council from all actions proceedings and claims in relation to the Council accepting the dedication of Lots 601 and 613 as road. ● The Council would be required to rely on the indemnity from the Developer in respect of any consequences of the redundant land covenant remaining or any other legal challenges. ● The Council takes the initiative rather than the Developer through the Court to remove the covenant from the underlying land through the Property Law Act. ● The applicant has been granted a Variation of the existing resource consent. ● Has changed the engineering plans for the residential area and the scheme plans for the commercial area in the manner agreed by the three traffic experts to ensure that the issues in the road safety audit are addressed and rectified. ● The applicant has completed the physical works for the residential area. ● Directs that before the roads in the commercial area vest in the Council, there must be a variation of the commercial area consent that provides that there can be no commercial development until the agreed road design changes are built. ● A Variation has been received by the Council and the road plans are being altered to comply with all the safety audit requirements. 5.2 Variation applications have been received and the road design scheme plans for the commercial area have been amended to meet the safety audit requirements. The residential section engineering plans have also been amended to meet the safety audit requirements. These plans have been approved by Council officers as part of the Variations. 5.3 The Variations to the subdivision itself, will be approved at the time of reporting. 5.4 The request from the Developer would allow Stage 1 of the development to proceed, while still fulfilling the obligations under the development consents and Council resolutions. 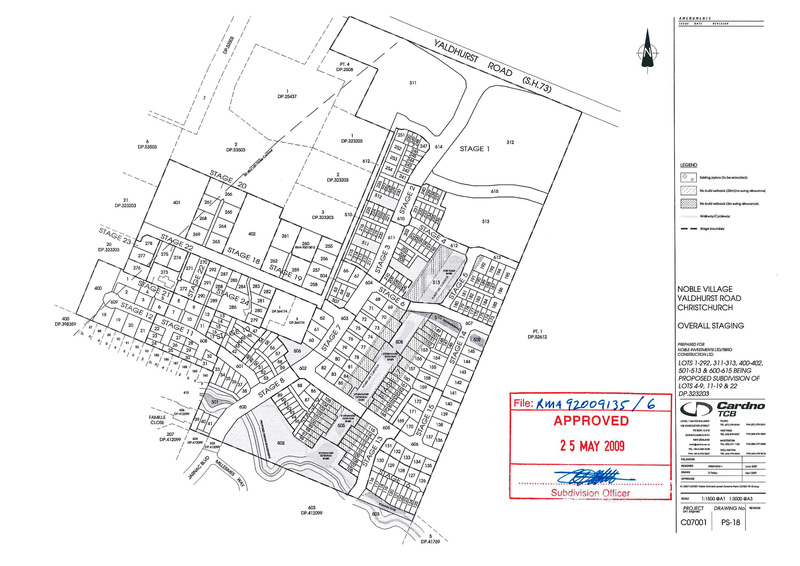 ● Dedication of Lots 601 and 613 is proposed for the Council’s consideration as the underlying land covenant instrument registered against Lots 601 and 613 means that the road cannot vest under the RMA, and the Developer has not been able to obtain the required surrender from some of the landowners, which would allow the vesting. ● The covenant on Lots 601 and Lot 613 on LT 448725 is also on the balance of the Developer’s land and precludes dwellings that are not private residential, temporary dwellings and caravans, and building materials such as polite and fibrolite. There are also building design controls and any building work to be completed in twelve months. Also, the Covenantor must keep all trees trimmed and must not use their land for certain farming activities such as pig farming. The covenant does not restrict the use of the land as road. ● Under Section 349 of the Local Government Act 1974, the Council may declare by way of dedication, a private road (intended for use by the public) or right-of-way to be a public road. Although Lots 601 and 613 are not currently open for public use, the view of our legal advisor is that the roadway fits squarely within the definition of private road in that it is intended by the Developer that Lots 601 and 613 be utilised by the public. ● If the Council accepts the dedication process, the dedication would be approved but not enacted until all the road safety features had been physically built and approved. ● The Developer and a suitable guarantor, will enter into a Deed of Indemnity with the Council and in a form provided by the Council’s solicitors, indemnifying the Council in respect of any consequences of the redundant land covenant remaining on Lots 601 and 613, and protecting the Council from all actions, proceedings and claims. ● The Developer would still proceed under the Property Law Act and through the Court to remove the redundant covenants from the underlying land (including Lots 601 and 613). This could take some time. 6.1 That the Council agree to allow the dedication of Lots 601 and 613 under Section 349 of the Local Government Act 1974 in conjunction with the developer proceeding with an application to the Court under the Property Law Act to remove the redundant covenant. 6.2 The level of significance of this option is low and consistent with section 2 of this report. 6.3 Engagement requirements for this level of significance are not required apart from the Developer notifying the other landowners with an interest of the process to remove the covenant from the road and the Developer’s adjoining land by an application under the Property Law Act. The other landowners also have the covenant on their lots but not all have agreed to remove the covenant from Lots 601 and 613. 6.4 This option does not involve a significant decision in relation to ancestral land or a body of water or other elements of intrinsic value, therefore this decision does not specifically impact Ngāi Tahu, their culture and traditions. 6.5 Mainly the landowners who have an interest are specifically affected by this option due to similar covenant. Their views have been canvased by the Developer. 6.10 As described under the Local Government Act 1974 and Land Transfer Act 1952. A Deed of Indemnity will be put in place to protect the Council in a form provided by Council’s solicitors, indemnifying the Council in respect of any consequences of the redundant land covenant remaining on the title and protecting the Council from all actions, proceedings and claims. 6.11 The risk to the Council is from opposition of the other lot owners with an interest in the land. This may result in complaints as to the process chosen. 6.12 Implementation dependencies are related to the legal process. 6.13 Implementation timeframe is based on this Council approval or the matter being resolved before the Court. ● Delivering a result for the Developer faster than the Court process to allow the subdivision to proceed. ● The perception by the other landowners who have an interest in the land that the Council is using an unusual step to dedicate the road. 7.1 That the Council not agree to a dedication process and inform the Developer to pursue the matter through the Courts under the Property Law Act to remove the covenant from the land. 7.2 The level of significance of this option is low consistent with section 2 of this report. 7.3 Engagement requirements would be nil. 7.4 This option does not involve a significant decision in relation to ancestral land or a body of water or other elements of intrinsic value, therefore this decision does not specifically impact Ngāi Tahu, their culture and traditions. 7.5 Only the views of the other landowners is applicable. 7.6 This option is consistent with the Council’s Plans and Policies. 7.7 Cost of Implementation – no cost to the Council. 7.8 Maintenance/Ongoing Costs – normal for any new subdivision. 7.9 Funding source – no cost to the Council. 7.10 The Developer accepts all the legal responsibility for the removal of the covenant. 7.11 The full risk is borne by the Developer to place the matter before the Court. 7.12 Risks to the Developer are that the Court does not remove the covenant from Lots 601 and 613. 7.12.1 Residual risk rating: the rating of the risk is low. 7.13 Implementation dependencies, once the Court approved the removal of the covenant then the process would be the same as option 1 or the standard RMA vesting process would be followed. 7.14 Implementation timeframe – dependent on the Court. ● The Council not being involved in removing the covenant under the Property Law Act. ● There are no other disadvantages provided the Developer still proceeds with the Variation and relating safety improvements. Compliance with Statutory Decision-making Requirements (ss 76 – 81 Local Government Act 2002). (ii) adequate consideration of the views and preferences of affected and interested persons bearing in mind any proposed or previous community engagement. (b) The information reflects the level of significance of the matters covered by the report, as determined in accordance with the Council’s significance and engagement policy. 1. Not agree to a dedication process and inform Infinity Yaldhurst Limited to pursue the matter through the Courts in accordance with the Property Law Act. 2. Agree to meet with the adjoining property owners to discuss options on a way forward regarding the Yaldhurst Village Subdivision. The Council continued considering item 21 at this time. Deed of indemnity on behalf of the council guaranteed by Infnity Yaldhurst Limited, a $10 company! So when it falls over is the council then liable if judgement is made in favour of the landowners? Rather than update councillors of what had resulted from the past 3 weeks [since CCC meeting of 6 July] and the arbitration in process prior to their debate [CCC meeting of 27 July], council lawyer and head of legal services Rob Goldsbury advocated for the developer and staff – he effectively threatened councillors to vote as he had advised and had threatened in non public. Goldsbury only updated from the other sides’ false view and failed to give the residents’ position which had been conveyed to him by email and to councillors. Clearly, Cr Vicki Buck and most other councillors had refused to read the updates sent to them by the residents (no surprise there). CCC have deep pockets. According to the residents, what happened at the 27 July Council meeting may have been a blessing in disguise! What the meeting video (above in the post) and the unconfirmed minutes show is that councillors voted for the most risky option. The staff report stated that ‘saying No’ put all the risk on the developer. 9 Voted opposite this; “YES” to dedication which was for the sole purpose of circumventing the residents’ legal covenant protection for their roading, stormwater and inclusion in the subdivision resource consent. A secret CCC memorandum of 2 Dec 2016 obtained under LGOIMA spells out the reason for “dedication”. It was so the developer could circumvent the covenant protection of the original landowners. Now CCC has circumvented this legal protection they are liable for the damages for doing so. They say Infinity will indemnify them. I hope so, the multiple original landowners being screwed are up for losses between $10m – $15m. Off to the side, readers have been wondering what sort of money is involved so to empower the residents’ fight for 8 years. Large. The potential sums provide focus. The developer and Christchurch City Council can now clearly be seen as jointly racketeering – and failing to uphold the Property Law Act 2007. The residents have already tabled an action for constructive fraud at the Christchurch High Court against several parties – and (for the interest of Dunedin/Otago readers) this includes, by joinder, Delta Utility Services Ltd. Observers suspect CCC will be made part of this action before long. “Off the side” $ losses, while accumulatively large, are just that. Any Council colluding with a developer to construct grossly non-complying “seriously unsafe” roads illegally without consent, illegally landlocking others from their parts of a subdivision consent, and then retrospectively consenting those non-compliances by ilicit means and oppressing affected parties of their legal rights is empowerment enough to fight. Financially it has cost me more than my tiny slice of the consented subdivision is worth. It’s very easy for those without all the facts to judge superficially. What I have come to understand through exchanges with caveator Colin Stokes these last years is he has meticulous understanding, learning and memory of all the details of this subdivision – anyone trying to pull the wool over his eyes or simplify the cmplexity of the legals can’t hope to succeed. If the profits are in the order of $10-15m then why not build the ‘little wee road’ (to quote an earlier post) yourselves and provide your own stormwater services as it has been suggested one of the other landowners was doing? Surely this would still leave a healthy profit. At worst you have your subdivision done and can sell lots and have crystalised the cost of the works for damages. The time value of money alone would lead to this being a worthwhile option over spending more money on legal battles and not progressing your subdivision??? Written by Infinity, Noble type, or Hutching ? None of the above – just a frustrated Delamain resident trying to understand why these people don’t want a road that will improve road connections for a lot of people as well as safety in and out of the Football Academy as Cr Buck clearly identified. That intersection is a disaster at the moment. Thanks for the clarification, Numbers game. If we could build our “wee road” ourselves we would. We’ve agreed to. It falls west to east 1.5m so needs integrated stormwater provision including basins to the east on land the residents transferred to the developer in consideration for this stormwater provision and “wee road”. CCC staff and developer have colluded to landlock us from this with illegitimate variations and undersized pipes and basins. CCC knew and know of the original owners’ legal rights to this stormwater provision and road. The stormwater provision and wee road (Road Lot 612) are conditions and obligations on the Developer/Consent Holder in his subdivision consent. But CCC are refusing to enforce the conditions of the consent and the Developer Infinity/Delta refusing to comply with them. The owner that bought 3 subdividable sites in a row – his Lots (1 to 3) are not part of the subdivision consent and he has no legal right through the consent to stormwater provision. He doesn’t require the road to subdivide and because he has 3 sites he can form his own common basin for them. He’s in a different situation and secretly sold 1/20th share of the original owners’ access lot to Delta/Infinity to help them screw the other owners. CCC staff and developer colluded in removing stormwater conditions and consenting variations without application or assessment. This collusion results in the original landowners subdivisions (apart from the one above) being impossible. The developer and CCC staff has our stormwater going west to land outside the consent that is impossibly 2m higher and can’t connect with the overall integrated Stormwater system. I hope this answers your questions. If not feel free to call. It is worth explaining to readers that 100s of people bought sections or houses in the Delamain subdivision around 2010 when the (then) Noble development was starting with the understanding that Jarnac Boulevard would link through to a new commercial centre on Yaldhurst Road. This area would provide a supermarket and other local commercial services for the local residents rather than having to travel further afield – we might even be able to walk the 500m to the shops rather than use the car! The majority of the work within the Noble development was completed around 2012 but the road has never opened and the supermarket has never eventuated due to the impasse between Noble and the neighbours. We have watched as other post-earthquake developments have started well behind this one but are now well advanced with comprehensive housing and commercial building having been completed. In recent years the football facility on the north side of Yaldhurst Road has been constructed and is a great asset for the City. Unfortunately there is a very dangerous access on an 80km/h road due to the intersection never being completed or opened. Hopefully the current work that is happening there will at least enable the north side of the intersection into the football academy open to improve safety. They had a large tournament there over the school holidays with 1200 participants from around the globe and it would have been fantastic if the intersection had been operational rather than visitors and buses needing to negotiate 1000 road cones on a never ending work site (not a great advertisement for post-earthquake Christchurch). We would also love to be able to drive 500m through the subdivision to the soccer facility rather than a 2-3km trip around the block. So, from a completely selfish point of view, it has been very positive to see work progressing again on the subdivision over the last 4-5 months and we hope that the Council decision will help get this road open for the benefit of the wider community who have put up with this issue for far too long. Where that leaves the neighbours in this dispute, I don’t know. Optimistically, maybe they can get around the table with the new main developer and find a solution but given the recent presentations to the Council that is probably unlikely. However, when I read they are looking at profit/losses of $10-15m I can’t help but think they may not be quite the innocent party they have made out – they obviously aren’t planning a small development and perhaps this is 2 developer parties both seeking to get a commercial advantage over the other? Whether it is or isn’t, there are still a large number of people in the wider community who are affected by the impasse and just want to see progress happen (and I would note, not particularly well represented by their Community Board who have predominantly sided with the view of one party to the dispute rather than trying to facilitate a solution for the wider community benefit). Those getting ripped off purchased in 2002 for their agreed subdivisions. Their wee road and services were due in August 2008 (2 years after rezoning). They were designed and constructed out of their subdivisions by the secret collusion of CCC staff and the consent holder. Amongst multiple owners they have 32 consented average 800m2 sites they stand to lose. At a ballpark of $300k that’s $9.6m. If they all choose to work hard and further develop houses etc (say for a living) that might be a loss of $15m. We are also part of the wider community and more aggrieved by the lack of progress than anyone. The delay is the developer and CCC’s doing. They constructed noncomplying roads (and infrastructure) without consent. The roads were later found to have “numerous serious and significant safety issues that would cause very frequent serious injuries and deaths” (Dr Shane Turner traffic expert). The elected Council voted to not allow the unsafe roads to vest. Residents only raised that the roads were grossly non-compliant because of safety issues, including those to Delamain residents and children biking/traveling to the commercial end and Yaldhurst. We’ve been around the table many times with the developer over the years, including Delta and more recently Infinity. They flatly refuse to comply with the consent to enable us to subdivide as the consent requires. CCC also refuses to meet. They oppress our legal rights and claim we are not “affected parties”. CCC also wrongly claimed Delamain residents weren’t affected in even a “minor” way by the unsafe roads to your commercial centre. The Community Board has advocated for safe complying roads and that the whole of the living zone land can be subdivided as the Environment Court and CCC and the RMA legally requires. All those things just happen to be on the one side, and CCC staff and the developer are not on that legal side. NZTA advised they were deceived by the Developer about the Yaldhurst Road SH73 sole access to this living zone. The original landowners own it, not the Developer. NZTA having acknowledged they were deceived, then used the road dangers THEY created (and allowed to continue for months) as a “cause” to use NZTA powers to quash the original landowners’ rights and assist the Developer to cut them out of the subdivision. The original owners are not responsible for the Yaldhurst Road dangers. The Developer, NZTA and CCC illegally created the dangers and then used them against the original landowners to cheat them of their interests in the subdivision. NZTA and CCC are now assisting the Developer to Landlock the existing residents from their legally entitled and required residential subdivisions. The 27 July 2017 CCC vote does not enable the Yaldhurst intersection to open. You’ll see in the CCC meeting video lawyer Rob Goldsbury returning to the deputation chair after seeing which way the vote went to declare the Lot 600 end piece of the spine road connecting Yaldhurst Road was not required for the shadowed following “dedication” vote. This removed the NZTA dilemma in not legally being able to close the original landowners’ access due to them being landlocked from their “residential consented” land parcels. The intersection can not LEGALLY open until the existing landowners have their formed and vested road to enable the consented subdivisions of their remaining land parcels, at which time NZTA can then LEGALLY close their existing access. In the mean time the spine road will be a giant cul-de-sac. I have NZTA Official Information Act obtained emails and letters recommending to the Developer that if they make the other end of the spine road with Buchanans Road unsafe, that could give cause for government powers to assist the Developer cheat the original owners from their inclusion in the subdivision; ie by giving the Developer their sole access rights while landlocking them from their consented residential subdivisions. All the original owners have been doing for 15 years is protecting that they are included in any subdivision as per their 2002-2003 interests that were protected by their covenants that CCC have now just circumvented. Original owners have not been holding up the subdivision, just protecting that they be included in it. The residents more than anyone have been concerned about the dangers. It was us that suggested NZTA remove the head-on crash concerns they had with their illegal short merge passing lanes they continued to allow for months – by simply painting the road back to one lane each way. What’s legal, in NZ, becomes ever more banana-republic-y. Who can afford to hang in their till the other party is destitute or dies, that’s The Law when it comes to councils (access to ratepayers’ money incl ratepayers they are in the process of ruining) and “institutions too big to fail”. “There is no corruption in New Zealand.” Sing up, big loud lies are better lies in the process of turning into Truth! We need elected people to stand up for and protect the little people from abuse of power by bureaucrats, not elected people protecting the bureaucrats from their wrongs against the people. Apparently there’s a Local Government “code of conduct” that “requires” elected members to support council staff, despite their mistakes and wrongs against the people. CCC elected members I believe were forced to sign allegiance to this code. I wonder if they have to clap loudly too, like in North Korea … actually they did – the CCC senior manager and cohorts that illicitly attained the retrospective consent for the unsafe roads they permitted be built without consent were praised in the public meeting by the then Deputy Mayor Vicky Buck. The citizens that did their civic duty in reporting their concerns of these public dangers (vindicated by the independent Safety Audit) and of which cost them $tens of thousands to do so, have been slammed by CCC staff and some Councillors ever since. Here’s link to the Dunedin City Council Code of Conduct and I think this is pretty much standardised throughout New Zealand. Here are some excerpts which I think show a strong bias towards the ‘private good’ of protecting the reputation of staff against the public good of accountability and transparency. • avoid doing anything which might compromise, or could be seen as compromising, the impartiality of an employee. It’s certainly impossible IMO for an elected rep to do any public whistle-blowing on a staff member without breaching the Code of Conduct. They can go to the chief executive but if the chief executive decides there’s no problem, that’s where it stops. Recently, there was a public demonstration of how well this system worked at the NZ Transport Agency…not at all! Working on the well-known principle of ‘when the cat’s away, the mice will play’, a robust anti-fraud and corruption system would not assume, as a starting point, the integrity and impartiality of all involved, as at present, but rather the reverse. One way to stop local bodies having their fingers in so many pies and getting involved in so many conflicts of interest and then digging themselves deeper into holes by refusing to admit any initial mistakes for fear of increasing liability would be for them to stick to their core responsibilities. These are now, after Local Government Act amendments, ONLY provision of local public services, local regulatory functions and local infrastructure. This law change, now severely restricting the ‘purposes of local government’, seems to be completely ignored by councils, as if it had never happened. I look forward to whenever central government decides to enforce it. The former Local Government Act which gave councils the ‘powers of general competence’ or to do anything to further the ‘four wellbeings’ (social, cultural, environmental and economic) amounted to yet another demonstration of power corrupting. It all went horribly to their heads and they still haven’t recovered. Thanks Diane, this confirms my understanding. Councillors can catch red-handed (or be given proof of) council employees, officers or contracted officials defrauding the public and report it only to the chief executive, who can then chose to do nothing as they do. It seems chief executives also can’t criticise and “have to” protect their employees – certainly CCC’s past or active three have (Tony Marryatt through to Dr Karleen Edwards). Councillors have to “treat (these known employee fraudsters) with courtesy and respect and avoid publicly criticising” them. Surely that’s repulsive. Worse, Councillors are then DEMANDED by these employees that they “must” vote as they are told by them; AND “must not” accept the request to meet with the victims of their fraud and their lawyer as was requested by the victims’ lawyer. On 27 July 2017 Councillors voted 9 to 5 to circumvent the victims’ land covenant legal protection of their subdivision interests. All those that spoke at the meeting referred to the strong advice given (including in public excluded) by the employees accused of the wrongdoing and constructive fraud. Many of the 9 stated their sole reason for their vote that circumvents the residents’ legal protection is that they’d been advised by these employees they legally had to vote that way. The rogue employees were simply scaremongering Councillors to vote as required to cover up their wrongs committed against the residents. “The Buck Stops Here” is a phrase that was popularised by U.S. President Harry S. Truman, who kept a sign with that phrase on his desk in the Oval Office. The phrase refers to the notion that the President has to make the decisions and accept the ultimate responsibility for those decisions. (Wikipedia). In NZ it’s a nightmare game of pass the parcel, as exhausting as the Dance Marathons during the Great Depression in the 1930s. The one rule is that Whoever was responsible for the cockup is -NOT- responsible for the cockup. Yes, it’s N Korea mode, or the Now [in]Version of the biblical “So the last shall be first, and the first last.” (Mathew 20:16). They who witness telling truth shall be branded liars, and liars shall be rewarded with riches on Earth. For the Rich Man hath made a needle with an Eye large enough to drive a D-11 dozer through with room for Choirs Of Praise to prance alongside harmonising his glory. Ditto people who e-mail you saying that they have just robbed the National Bank of Nigeria, and….. The same can be said of the Moray Place hotel “gift”. Always look gift hotels in the mouthpiece. Several purchasers and several lawyers did due diligence on the deal prior to uptaking the 100% freehold of 4ha Rural Blocks. The deal came with a “buy back” option for around 80% of the land IF residential zoning and subdivision consent was attained. The “buy back” “consideration” was the roading and services to the purchasers remaining 20% of now residential land. It was a fair “straight forward” deal made by and checked by NZ lawyers. Residents reluctance to sign back 80% of their land ahead of the roading and services was met by threats through lawyers to sue them for $50m for holding up the subdivision. We were between a rock and a hard place – effectively IN Nigeria with a gun each side of our head. We had an expectation that NZ lawyers and the Courts (and Councils) were not corrupt, so transferred the land ahead of the roading consideration (and so as to avoid the $50m law suit). It was a sophisticated set up through lawyers – we were screwed either way. Corruption is rife in NZ as you say, and we’ve experienced it extends to “friends in court” – respectfully, the Nigeria scam pales in comparison. It’s not just a Christchurch problems. Have a look at this video shown on Fair Go last night. it is on the TVNZ website under the title ‘Lost’. In particular look a the Auckland Council staffer from 7′.30″ on in the video. Do you think that he has ANY intention of doing anything? Thanks Rob. Christchurch is worse unfortunately. Not only did CCC staff refuse to notify affected parties of variation applications for gross non-compliances with the District Plan, they instructed that if a particular traffic engineer wanted the commission to review the road network he would have to NOT review the grossly non-complying roads that CCC had already permitted Delta to construct without consent. CCC for itself and the Developer then falsely advised their selected commissioner that the traffic engineer had reviewed the grossly non-complying narrow main road when he specifically hadn’t. The residents later learned that CCC had also permitted the Developer and Delta to install undersized stormwater infrastructure that specifically makes the original landowners parts of the subdivision impossible. Staff won’t do anything here either, and even refuse to meet. A majority of Councillors also believe they MUST accept CCC staff and lawyer advice, which includes refusing to receive ratepayers and their lawyers advice that CCC staff have “stuffed up” again.